The company KTEL HERAKLION-LASITHI S.A. is the largest transport organization in Crete and one of the largest in Greece. Having 200 modern buses of all sizes, it conducts hundreds of routes daily. 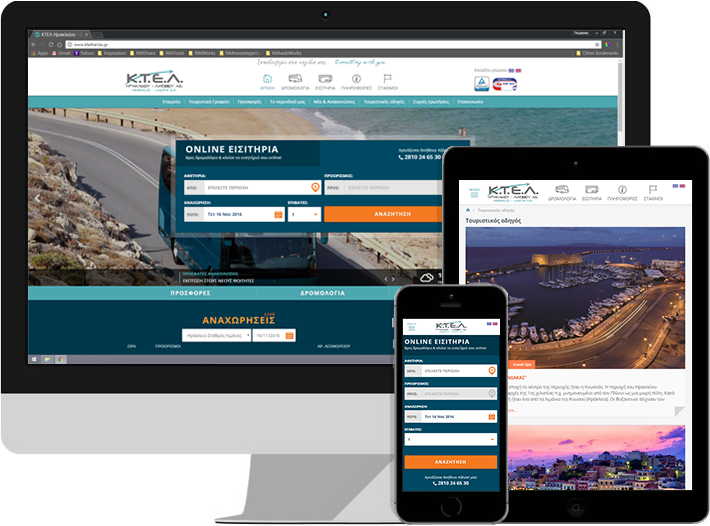 The company KTEL HERAKLION-LASITHI S.A. is the largest transport organization in Crete and one of the largest in Greece. Having 200 modern buses of all sizes, it conducts hundreds of routes daily, thus linking the major cities of the island with all the settlements, but also with the rest of Greece within a framework of combined transportations. By implementing a long-term development planning, within the last few years we have replaced all the buses, all our functions have been computerized, we have renovated our stations and our agencies and we have bought a property of about 20 acres next to the airport of Heraklion, where we have already begun constructing our facilities and maintenance infrastructures so that a modern Cretan station will be installed there in the near future. Our goal is the safe and quick transportation of passengers and packages to as many destinations as possible in Crete, inGreece as well as abroad. Looking at the future, our 500 employees and partners strive to provide the best services, thus contributing to the development of the island, but also of the country in general. Having as our main slogan “Travelling with you...”, we daily follow your every transportation, turning each one of your journeys into a luxury TRAVEL of comfort and certainty.